Comments: Nonbreeding Brown Pelicans have a white to yellowish head and neck. Breeding birds have a dark hind neck, yellowish head and a dark to red gular pouch. Young birds are dark gray with a white belly. This species is found along ocean shores and bays and the only pelican to plunge-dive for fish. Nests are constructed on the ground on small remote islands, cliffs or occasionally in small trees and bushes. 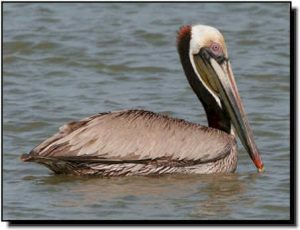 Brown Pelicans occur in small numbers or are found only in localized sites within the Great Plains.